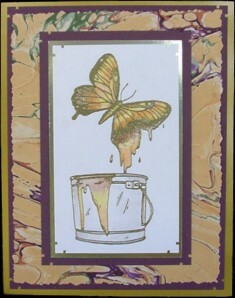 On white card stock, stamp and emboss Butterfly using black ink and gold powder. Color with chalks and blend with Dove Blender. Layer as shown. The corners were cut with the Southwest Corner Punch. Background paper is a marbled paper from Embossing Arts.